Who doesn’t love ice cream? I stock my freezer with the yummy treat because my kids love it. 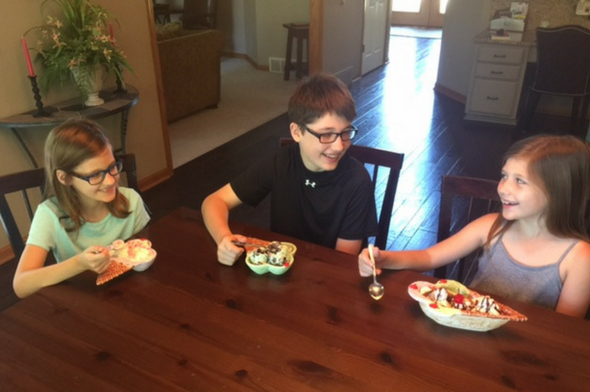 And, because today is National Creative Ice Cream Flavors Day, my kiddos jumped at the chance to come up with their own flavors. Here are a few of their favorites! Cut up pieces of your favorite chocolate chip muffins and blend with Hiland Dairy Mint Chip Ice Cream. Add chunks of juicy watermelon to Hiland Dairy Old Recipe Real Vanilla Ice Cream. Sprinkle chopped peanuts and banana slices on top of Hiland Dairy Neapolitan Ice Cream. Top with whipped cream and chocolate syrup. With more than 40 flavors of Hiland Dairy Ice Cream, the possibilities are endless. Go for it!